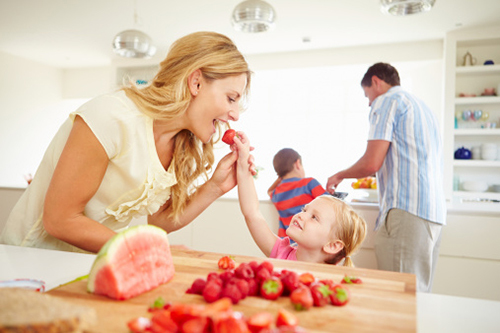 A mother’s perception of providing a functional family atmosphere may play a significant role in her child’s development of healthy eating habits, especially their sugary food intake, according to a new study out of London, England. In past studies, a high-sugar diet has been associated with an increased risk of obesity and dental caries and may even play a role in the development of other chronic diseases, such as diabetes and heart disease. Diets high in sugar tend to be low in nutrients needed to sustain general health and prevent disease risk. The impact on younger populations is even more concerning, because they may be displacing nutrient-rich foods that are necessary for proper growth and development with sugary foods. For this reason, emphasis is usually placed on mothers teaching their young ones healthier eating habits from an early age. Now, researchers from Queen Mary University of London have evaluated the affect that general family functioning may have on sugary food intake among three- and four-year-olds within the outer northeast London area. Participants included 1,174 children and their families who were part of the East London Family Study. Their findings revealed that 17% of participants were consuming sugary foods more than four times a day. However, a mother’s level of education was linked to a reduction in the frequency at which children consumed sugary foods. Furthermore, with a positive increase in general family function, a 67% reduction in the frequency at which sugary foods were consumed was also noted. Therefore, effective general family functioning may help reduce the amount of sugary foods children consume, regardless of a mother’s education level. This study suggests that public health interventions should focus on improving family functioning, rather than simply health education. Nanjappa, S., et al., “Mother’s perception of general family functioning and sugar consumption of 3- and 4-year-old children: The East London Family Study,”Caries Research 2015; 515, doi: 10.1159/000431234. “High sugar consumption among children relates to poor family functioning, study finds,” ScienceDaily web site, August 21, 2015; www.sciencedaily.com/releases/2015/08/150821103649.htm.